Of course he already talks really loud anyway. It's like he has a different perception of what is loud than others I guess. So he does not see how loud the video or whatever is in public. To him it's normal conversation level. People's ability to hear varies quite a bit. Yeah, well my dad has always been a loud talker. It's just who he is. We have to get him to quiet down when we go visit my sister because of the baby...and the dog. The little dog is intimidated because he is so loud. Heck, our own big part black lab is intimidated by him, but he's a big baby. He was so nervous during the days surrounding 4th of July with all the fireworks. He also runs into another room when the vacuum is turned on. But my dad has to be extra clear with him that he is being affectionate and my sister's dog just runs. Only person my sister's dog runs form really. Me answering phone at work: Blahblahblahblah, can I help you? Irate caller: I SURE HOPE SO!!!!!! Meanwhile I lay my head on my desk and weep because I hear this fifty times a day. When I have nothing better to do so I accompany my mother to the Mall and/or women's department stores and in the mix of all the women shopping and the maze of clothing displays, I get separated from her like and alas, I'm alone inside of a jungle of overpriced clothing, nose-burning perfumes, and attractive women. Just waiting nervously like a sheep lost from its shepherd until I see my mother again. When you go to the store with someone and they tell you to get in line and that they'll be right there. And then before you know it it's about to be your turn to pay, and you're nervous out of your mind sweating because they have the cart full of things to buy and they're not back yet. When you go with your friends to get something to eat and they ask for a fry but they end up taking a small handful. Dear heavens, where to start? Going anywhere in public with my mother, who is, quite frankly, blind to any sense of social propriety, and will raise her voice in conversation. But don't put it out to her, because if you do, she'll loudly say "I'm not shouting!" then proceed to demonstrate shouting to everyone, "THIS IS SHOUTIIIING!" You have my deepest sympathies. Are you in "customer service", per chance? The very worst thing about customer service is........customers! I am somewhere between an administrative assistant and secretary at a hospital. Is this one coworker that does this all the time? If so, gosh. Ever wonder why sick and injured people are called "patients"? No, these are calls coming from the outside. Years ago I held secretarial jobs in a doctor's office and then through a temp agency in a few hospitals. I really feel for you . . I DON'T miss having to deal with patent's. I felt like everyone wanted a piece of me and by the end of the day my nerves would be frazzled. I've been doing medical transcription work for 15 yrs. so my work is behind the scenes. I have medical transcription training. I wish I could be doing that instead. Ah well. People stating the obvious. Walked into a Bible study once holding a cup of Dunkin Donuts coffee (the cup had their logo on it) and the guy next to me asked me, "Is that Dunkin Donuts coffee?" It's raining outside. It's obviously raining, as the raindrops are hitting the windows and it's thundering. The lady sitting next to me asks, "It's raining?" On a somewhat related note, I hate when you walk in on Evangelicals having a Bible study or theological discussion at a public place and they're purposely trying to talk loud or draw attention to themselves so others hear. Get out of here . . . .really? I really wanted to ask the same thing. Pet peeve - when you're driving the speed limit (even 5 miles over) on a local road and the person behind you is right on your bumper, whose facial expressions and hand gestures indicate that they think you're not going fast enough for them. Happened yesterday to me. I have a pretty long fuse and am not prone to road rage, but I eventually pulled over and motioned to her to pass me while yelling, "Pass me if you're in such a hurry!!" and she went on by. Hey, I wasn't in a hurry to get anywhere. My solution, for my personal delight, is to go slower. When there is a merge of two lanes going down to one and everyone piles into one lane and then strattles the lanes so traffic can't use both lanes to the merge point. What the heck!!! There is a merge point for a reason! It isn't so you can create your own personal merge point behind your bumper! It is a good thing I don't own firearms because lane strattlers would go meet their Maker if I had one while they were attempting their screwup of traffic. Not sure I have seen this, but I can imagine it is true. Mine would be Evengelicals going to South American and Middle Eastern countries. Catholics are Christians and do not need to be converted to Evanvelicalism. Keep them out! We don't want a great culture with what Evangelicalism produces. And they cause more trouble than good in the Middle East as they have no sense of prudence and tend to be Zionist. They can't relate to Orthodox and Catholics in the Middle East. They cause more tension with Muslims. Orthodox and Catholics have learned to get along in heavily Islamic places. Evangelicals want to "save" everyone. I hate when you enter a freeway (especially true for me since I'm a new driver) and foreign drivers who barely know the rules of the road wait until they are on the freeway before accelerating to the required speed whereas you're supposed to use the merge ramp thing to accelerate to proper speed before entering the freeway. 1) When people wait until the last minute to signal. Really, what difference does it make if you do the action while signaling? Perhaps if you actually did it a few seconds earlier it'd mean something. Even worse are people who don't signal at all. I am not a snob and am guilty of eating fast food and Chillis. Guilty of eating Olive Garden. But I hate when people think that they are supposed to get the same "value" at a real restaurant that they get at a chain. You are not going to get the 2 for $20! Get over it. These are real chefs and employees who do not have the benefit of working for some multi-million corporation that pays its workers low wages while its CEOs make millions. The food is better at "real'" restaurants. You have to pay a little more to eat real Italian or at a real steakhouse instead of Roadhouse or whatever. My parents are among such people who do not understand, especially my dad, who is big on a value. He is a bit like, as I have said, Kevin Arnold's dad in "The Wonder Years". "14 dollars for a sirloin! Where's the value deals!?" Chili's and Olive Garden are two of the chains that pioneered the current microwaved-meals industry seachange. That's right, using new food science and technology, the meal you order at Olive Garden was manufactured miles away and has just come out of a microwave. Mainly because im interested in this. Yeah, I figured it was really cooked there, not with fresh food or anything, but with the typical Italian American style that makes Americas think they are really eating Italian instead of commercial Italian-American. Thank you! How is it that people don't understand this very simple concept? Worked in a commercial kitchen with a chef who had been Chili's point man for rolling out this retooling. Why? I am curious. Oh and I need to say and pet peeve while I am here. How Netflix keeps freezing. Even when I go to McDonalds to watch it, it freezes every so often. I have to restart my computer. It's really annoying me on top of this satellite internet. I never liked the character. I liked him because I felt a likeness too him. Not that I am some genius detective but the social awkwardness and deep love for a particular woman who looks past that and can love him. It's a beautiful love story they created if you like that sort of thing. I always put my wallet in my left pocket and my keys in my right. If it's not that way, I don't leave the house until I fix it. Yes. I hate it too that people don't seem to know how to cook anymore. It doesn't take much to make a simple meal. Even on my busiest days I could still at least make an omelette or a tuna & cannellini bean salad for my husband and it doesn't cost very much. 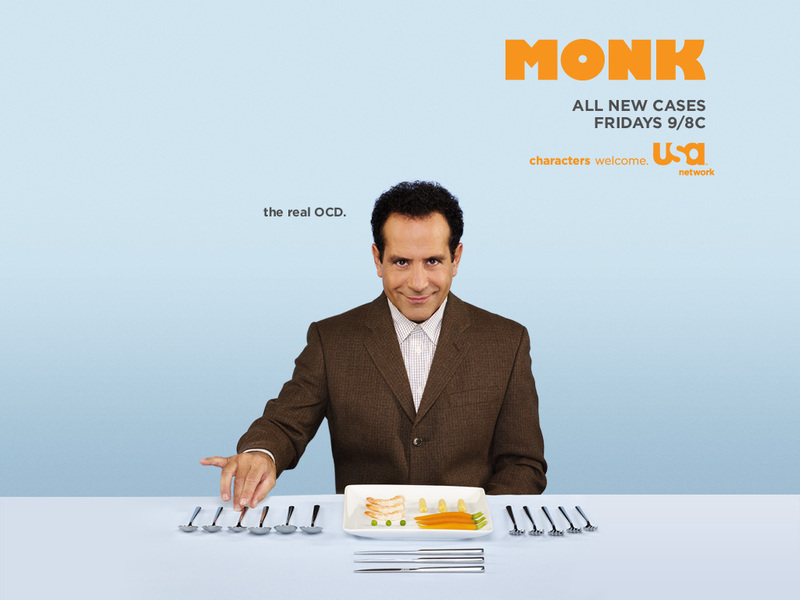 Would Monk say you are left handed because you picket your wallet in your left pocket. I am going to guess 1:2 odds you are left handed. I do this and I'm right-handed. But if it happens to not be that way, I still leave the house. If I do put my wallet in my side pocket, it is almost always the left. Same the with keys. But I usually carry the wallet in the back pocket. I tend to want to put everything in the left pocket. I have to sort of balance it out if I am carrying my medicine for the day. The sound of the shaking peels is sort of a pet peeve. Pet peeve #14 - My email crashing just as I try to send something important (that I didn't bother to save).